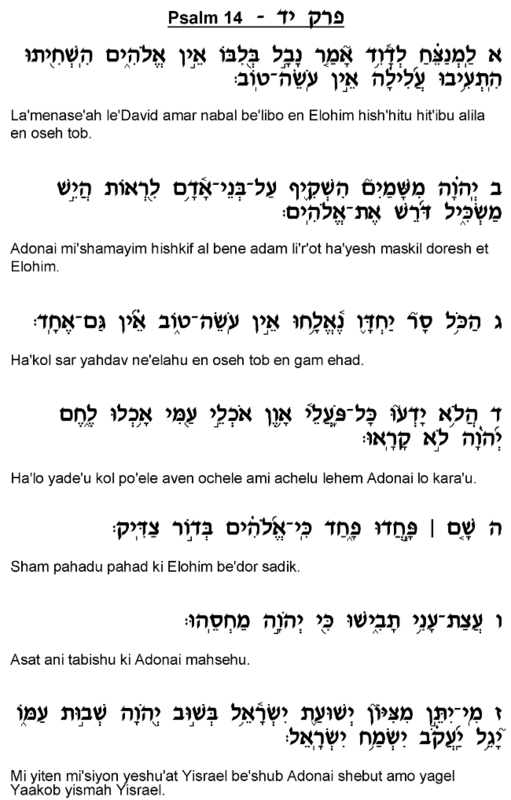 Rashi and Metzudat David explain this Psalm as a prophetic lamentation of the destruction of the Beit Ha'mikdash at the hand of the Babylonian emperor Nevuchadnetzar. Although David lived even before the <?xml:namespace prefix = st1 ns = "urn:schemas-microsoft-com:office:smarttags" />Temple was built, he beheld through prophecy the great tragedy of the destruction that occurred several centuries after his death. This reading of the chapter is supported by its final verse, in which David prays for Israel's salvation as manifest through the nation's return to Zion, strongly suggesting that the subject of this Psalm is the painful tragedy of Israel's exile. Interestingly enough, David's reaction here to the Temple's destruction focuses neither on the human suffering that accompanied this calamity, nor on the actual loss of the Beit Ha'mikdash. Rather, he emphasizes the heresy of the enemy nation, and particularly of Nevuchadnetzar himself, whom David describes here as a "Navval," a "fool," who says to himself, "There is no God" (verse 1; according to Metzudat David, the reference here is to Nevuzaradan, the general who led the battle against Jerusalem). He is bewildered by this belief expressed by the Babylonian king and by the mass following that he has attracted. David depicts God as searching in vain for believers, for those with the intelligence to realize that He governs the earth and punishes the perpetrators of evil (verses 2-3). According to Metzudat David's interpretation of verses 4-5, David notes here as well the irony in the fact that Nevuchadnetzar himself had already witnessed God's overt intervention in world affairs. Tradition teaches that Nevuchadnetzar was present during the Assyrian siege on Jerusalem, which ended in the sudden death of the entire Assyrian army (see Melachim II 19:35). At that time, the Jews were deserving of God's salvation, and He therefore intervened on their behalf. But later, when Nevuchadnetzar became emperor of Babylonia and besieged Jerusalem, the Jews no longer earned God's favor, and He allowed the Babylonian empire to destroy the Mikdash and exile the nation. Nevuchadnetzar failed to recognize this link between the Jews' obedience to God and his success in defeating them, and he blindly attributed his prowess to his own, independent skills, refusing to acknowledge the existence or involvement of God. 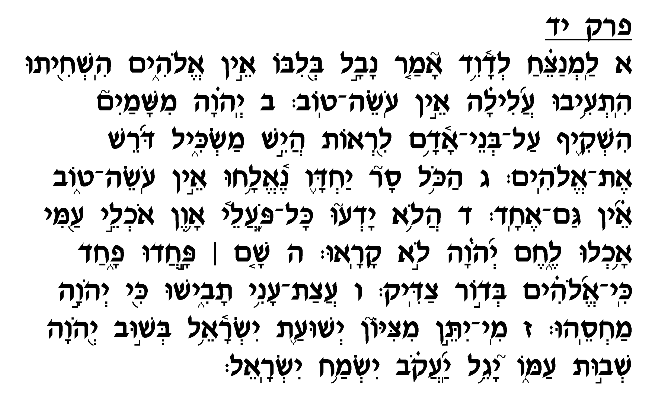 David concludes this otherwise mournful chapter by expressing his eager anticipation of the time when "Yaakov shall exult, Israel shall rejoice" with the Jewish people's return to Zion. The nation's return will reveal the fallacy of Nevuchadnetzar's cry, "There is no God," and will demonstrate to all mankind that there is, indeed, a righteous God who holds wicked men accountable for their crimes, and who will ultimately redeem His nation from those who oppress them.